Samsung Galaxy, (Hangul: 삼성 갤럭시) formerly known as Samsung KHAN, was an eSports works team of the South Korean corporation Samsung Electronics that fields teams in League of Legends (LoL). 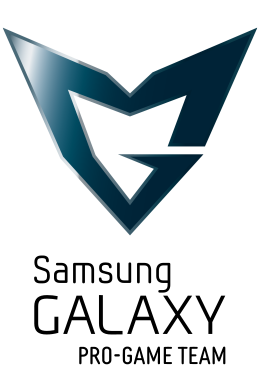 On September 7, 2013, the Samsung team acquired the MVP work team's LoL team, and the entire team was subsequently renamed "Samsung Galaxy." Samsung Galaxy White won the 2014 League of Legends World Championship. Samsung Galaxy also finished as the runners-up in the 2016 League of Legends World Championship and won the 2017 League of Legends World Championship. After their World Championship winning run at the 2017 League of Legends World Championship, Samsung set their professional League Of Legends-team for sale, eventually selling it to American entrepreneur Kevin Chou. Chou later rebranded the roster to Gen.G . ^ "삼성전자, 갤럭시 프로게임단으로 새출발". This Is Game. 7 September 2013. ^ Lam, Kien. "SK Telecom T1 wins World Championship again". LoL eSports. Riot Games. Retrieved 30 October 2016. This article related to an esports organization is a stub. You can help Wikipedia by expanding it. This page was last edited on 10 April 2019, at 08:37 (UTC).